Water and sewer lines are largely ignored by most home and business owners. That is, until an issue arises. Because they’re located underground, these stretches of pipe don’t get nearly the attention or maintenance as our indoor, visible plumbing and components. However, the main sewer and water lines running to and from your home are critical in ensuring proper flow of waste and water, respectively. Sewage lines run from your drains to the main public sewer system to ensure that waste is moved out of your home or business. Water lines, on the other hand, bring water toward the structure to ensure that water is available for every toilet flush and every faucet turned on. When this system breaks down, be it due to cracks, leaks, or simply timeworn materials, the location and scale of these lines requires a professional touch. Call (720) 363-2907 in Denver, CO and Westminster, CO for water and sewer excavation to repair or replace damaged water or sewer lines! Any time you are digging deep into the ground, it’s important to know what you’re doing. Especially given how sewage and water lines connect to public utilities, mistakes in the excavation process to identify clogs or damage to underground piping can be costly. Best Plumbing of Denver has worked with many homeowners, commercial property owners, and public entities to install, repair, and replace water and sewage lines. We understand the complexities of excavating with care, and utilize the best tools and methods to reduce unnecessary waste and prevent further damage. We also expertly re-cover the excavation site after repairs have been completed to restore the space and ensure that the area can be safely accessed once again. We’ll also obtain the necessary permits, so you know that the work we’ve done is up to code and executed in a manner that will stand the test of time. After all, you don’t want to have to keep digging over the same area and deal with all that mess to fix a poorly installed or repaired line. 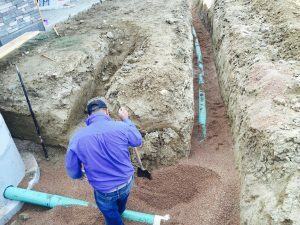 Best Plumbing of Denver is also proud to offer trenchless excavation, so we can evaluate your project and determine if this no-dig option is right for the job. Contact us at (720) 363-2907 for an evaluation of water or sewage line damage in need of repair or replacement. We’ll share more information about water and sewer excavation for your Denver, CO or Westminster, CO property. Updated on July 27, 2016 at 7:17 pm by Best Plumbing of Denver.